I soon received a reply informing me that my services were no longer required. I assume the reason behind this bizarre situation was that these folks were part of what is known as the King James Version Only (KJVO), crowd. This small but oftentimes belligerent movement found in some Christian circles insists that only the King James Bible of 400 years ago is a reliable and accurate Bible to use. There is a spectrum here, from some sincere folks just strongly preferring the KJV and not using others, all the way to the wild extremists. This latter group believes that God in fact inspired the KJV of 1611, that it is perfect and without error, and that all other versions are of the devil. Some of them have actually said that if you do not know English, yet desire to be a true Christian and understand the Word of God, you must first learn English and read the KJV only! Some even seem to think that it was the Bible the Apostle Paul used! Yes, sadly, such folks really do exist. I have encountered way too many of them and know of too many horror stories about these folks. Some will actually say that you are NOT a Christian and you are going to hell if you do not read the KJV. These extremist folks, simply put, really are cultists and into a bizarre and unfruitful obsession. We must give them the widest berth possible. But as I say, not everyone in this camp is so extreme. Lots of folks are well-meaning, but might be uninformed or ignorant about the very complex issues involved, and they will often just take at face value what some YouTube videos or less than reliable websites say, accepting them as gospel truth. They need some discernment and understanding here, and owe it to themselves and others to do some careful study on this. The influence of the King James-Only viewpoint has become widespread and strong. Unfortunately, the effects of this movement have often been highly destructive. Beside the strife and dissension that many organizations have faced, some groups have actually split over the issue. Many local churches have faced similar, unfortunate conflict and division. The King James-Only movement has spilled over onto mission fields, causing distress in national churches and alienating missionaries from each other. It has led some American missionaries to denounce reliable foreign language translations simply because those translations were not based on or did not always agree with the KJV. What is most unfortunate is that all of this schism is grounded in a belief that has no biblical basis: that the original autographs of Scripture have been perfectly preserved in a particular text, text family, or English translation. Accepting the tenets of the King James-Only movement has become a standard of orthodoxy for many people. This is absolutely true, and sadly I have encountered this first hand – and far too often. I have actually had people who claimed to be my friends and brothers or sisters in Christ turn on me and break off all fellowship with me simply because I dared to differ with their unhelpful and mistaken views. Some even now see me as a heretic or worse! So how do we assess these insistent and often raucous claims that only the KJV should be read and used by believers today? Because this discussion is so complex and large, the matter actually gets quite complicated. We are dealing with a number of important issues, including knowledge of the original languages, the science of translation, textual criticism, assessing manuscript evidence, and so on. It is not my intention to get into a full-fledged discussion of everything here. Entire books have already been penned on this – even entire libraries. Even though I am offering a lengthy four-part article on this, the reader is advised to consider this to be just a very brief and sketchy overview. I hope all of you will look carefully at the many books and articles I recommend at the end of this article. -Authorised Version (AV) = a common name for the King James Bible. Although said to be authorised by King James I (reigned in Scotland from 1567-1625, and as king of England from 1603-1625), this is somewhat misleading. Earlier Bibles such as the Matthew, Great and Bishops’ Bible were considered to be “authorised” by earlier kings, such as Henry VIII (reigned from 1509-1547). -Text types = broad groups or families of Greek manuscripts, such as the Byzantine, the Western, the Alexandrian and the Caesarean. -Textus Receptus (TR) = Latin for “received text,” the title given to the 1533 version of the Greek edition of Erasmus (originally done in 1516). While the MT and TR are similar, they are not the same. The MT differs from the TR in some 1800 places. -Majority text type (MT) (or Byzantine text type) = a major text family which led to the Textus Receptus, and became the basis of the KJV. These are less old but more numerous Greek NT manuscripts. -Alexandrian text type = older, fewer, and often more reliable Greek NT manuscripts. -Autographs = the original texts of the Bible, now lost to us. -MS = manuscript, singular, a hand-copied document. 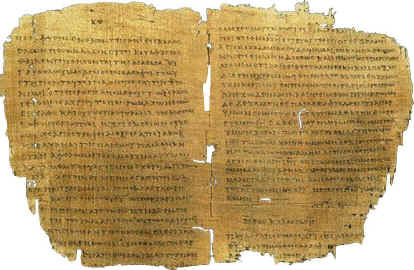 -Codex = a manuscript in book form (the earliest NT writings were on papyrus scrolls). -Palaeography = “the science that studies ancient writing, preserved on papyrus, parchment, or paper, occasionally on potsherds, wood, or waxed tablets” (Bruce Metzger, 1981). -Textual Criticism = “the study of copies of any written work of which the autograph (the original) is unknown, with the purpose of ascertaining the original text” (J. Harold Greenlee, 2012). -Textual variant = “any place among the MSS in which there is variation in wording, including word order, omission or addition of words, even spelling differences” (Daniel Wallace, 2011). -Critical text = what almost all recent versions follow, as opposed to the TR. “Critical is not a negative term but simply denotes the Greek text achieved by using the method of textual criticism to identify and eliminate copyist errors. Critical texts also provide footnotes identifying variant readings and their manuscript support so that students who know Greek can evaluate variants for themselves” (Fee and Strauss). Most of the main players here are Americans. But John William Burgon (1813-1888) was among the first to promote this. He was an English Anglican, and Dean of Chichester Cathedral. The KJVO view was initially articulated by Benjamin G. Wilkinson (1872–1968), a Seventh Day Adventist missionary, in the book Our Authorized Bible Vindicated (1930). -David Otis Fuller, (1903-1988), Baptist pastor, Which Bible? (1970). -Peter Ruckman (1921-2016) American Independent Baptist pastor, King James Onlyism Versus Scholarship Onlyism (2007). -Gail Riplinger (1947- ) American writer, New Age Bible Versions (1993). -Kent Hovind (1953-) American creationist and writer. -D. A. Waite, American pastor, current president of The Dean Burgon Society (founded in 1978). Other names could be mentioned here, ranging from the more scholarly Zane Hodges to the wilder and more reckless Jack Chick. But the entire concept is relatively new. Thus no one was really making a stink about all this until just this past century. -Caedmon (a seventh century monk who died around 680), who offers us the earliest known English translation. -The Venerable Bede (673–735), an English monk who translated the gospels into English. -Alfred the Great (reigned 871-899), the English king and scholar who translated into English parts of Exodus and parts of Acts. -The Wycliffe Bible (1384), perhaps actually done by his secretary John Purvey, but he and his associates produced the first English translation of the entire Bible. -Tyndale New Testament (1525), which was the first translation not done from the Latin text, as previous ones were. -The Coverdale Bible (1535), largely based on Tyndale, the first complete printed English Bible. -The Matthew Bible (1537), done by John Rogers, an associate of Tyndale. -The Great Bible (1540), also prepared by Coverdale, based on the Matthew Bible. -The Geneva Bible (1560), reflecting a Calvinistic orientation, it was done by English Protestant exiles under Queen Mary, and was the first English Bible to use chapter and verse numbers. -The Bishops’ Bible (1568), a revision of the Great Bible by Archbishop Parker and his colleagues. -Rheims Catholic English NT (1582), translated from the Latin Vulgate, the official Catholic Bible. Many of the above works went into the making of the KJV. Today there are more Bible translations in English than in any other language. Now we have around 450 English translations of the Bible. 1611 The first edition of the KJV. 1631 This is the infamous “Wicked Bible” that left the word “not” out of the seventh commandment! 1638 The “Forgotten Sins” Bible that mistakenly used the word “forgotten” instead of “forgiven” in Luke 7:47. 1653 The “Unrighteous Bible” which renders 1 Corinthians 6:9, “know ye not that the unrighteous shall inherit the kingdom of God?”. 1769 The Oxford revised edition compiled and edited by Benjamin Blayney, the most common version of the modern King James translations – it includes thousands of differences compared to the original. 1801 The “Murderers Bible” that misprints “murderers” for “murmurers” in Jude 16. 1885 The Revised Version (RV), an officially authorised revision of the King James Version (KJV). 1982 The New King James Version (NKJV). It might amuse you that I was once held under suspicion for stealing a copy of the Bishop’s Bible (1568), which had been placed in a cabinet in an ancient church, St Nicholas, in Child Okeford, a village in North Dorset, in which I lived for eight years. At the time I had had a dispute with Shirley, the vicarette, priestess, whatever one wishes to call them, over the issue of women clergy – particularly women bishops – so that when the Bible mysteriously disappeared she was eager to name me to the police as a suspect. I am glad to report that the Bible, which was reputed to have been used by the Rev William Kethe (vicar from 1561 to 1594) who wrote the hymn, “All people that on Earth do dwell”, was retrieved and is once more in its rightful place , after being there for over four centuries. But Shirley thankfully left some years ago. Leave it to David Skinner to go around pinching ancient Bibles! Well, how modern? Many of the newest are dreadful. I think people just worry about actual changes…dropped passages etc in the newest editions. Gender reassignment for God (gender neutral). Queen James, well it supposedly is a thing, I won’t be reading it. Grew up with the revised standard. They also gave us a “modern paraphrase” new testament called the Good News Bible, a paperback. So even in the 60’s some churches worried about people not understanding. That was the Presbyterian church, and our proudest achievements were sending missionaries to Taiwan and helping to translate bibles into native languages. oh, how the mighty have fallen. Daughter uses the ESV and I use a King James. I fell in love with it, but having been an English major, reading Chaucer, etc perhaps it just feels familiar to me. I also have the Aramaic bible and have had several study type bibles don’t remember the names now. So you were de-platformed because you wanted to use another version. Brainless. Their loss. I suppose these days you have to leave your pad or phone at the door in case you want to open your NIV or whatever. Talk about weird! My personal view is that, if you need to base your doctrine on the precise wording of a text, in English or even in the original languages, then the doctrine is suspect. People, even the writers of the Bible, use words imprecisely. It is the message which is important, and it is unlikely to depend on the change of a single word (except, of course, the 1631 and 1653 mistakes). That being said, it is still a good idea to know what the words really mean. Having had more than one unpleasant encounter with KJVO extremists, I just read part one of your article, and now eagerly anticipate parts two and three. Mostly I try and go by the KJV as it is more accurate. But I sometimes use the Net : Bible Hub which gives me different translations of a verse’s meaning , then I am able to see where it is heading… But most people I know who use the KJV are not legalistic about it. My son in grade 2 aged 7,, many years ago & read in detail from the King James version at a public school he had no problems using the KJV. The KJV seems to cause one to think about the clearer meaning of the words more so than other translations. We need to hear from someone who can give us the reasons why the KJV they think is better…. Thanks Vicki. Although as I tried to demonstrate in this 4-part article, it would be misleading and somewhat incorrect to say that the KJV is the most accurate. It was a good translation for its time, based on the manuscripts and knowledge they had at the time, and it is still very useful today of course. But so many new discoveries of manuscripts and so on make for other helpful, newer translations. Good as the text is, worshipping a text is dangerous, as it takes you on a sideline, away from the Originator of Truth, God Himself. The Pharisees worshiped the text of the Torah & missed Jahweh. Same here with brutal KJVO lagalism. Their fruit is contra God’s Holy Spirit fruit. Do not spend too much time fretting on them. They are a distraction to fruitfulness for the Kingdom of Jesus Christ. Keep on being a faithful servant, as Timothy was. The rest is taken care of, Bill, in the eternal truth of Rom 8:28, in whatever translation. Zane Hodges and John Burgon were not KJVOs; they disagreed with the “critical text”. Burgon would be expelled from the Dean Burgon Society because he was not KJVO. I wish you all the best in tackling this topic; it really needed to be done. I’ll post them on my pages. Many thanks Jonathan for that important clarification. An accurate addendum might go like this: While all KJVOists dislike or distrust the critical text, not all who are critical of the critical text are KJVOists. This has at times led to the justification of women being able to lead men and be deacons/pastors in the church. This contradicts the clear instruction that deacons are to be the ‘man of one wife’ etc, and that women are not to teach men in a church setting. The KJV and other reliable versions state that Phebe is a servant, not a deacon – there is a world of difference! ‘I commend unto you Phebe our sister, which is a servant of the church which is at Cenchrea:’ (KJV) It’s really frustrating as it is a very serious error. Thanks Sarah, but…. This is another clear case of how knowing a bit about how translation theory works, and having a bit of an understanding of the Greek can be of some real help here. I would first say that the text should always determine our theology, and not our theology determine how we understand the text or translate certain words. The issue of female leadership in the church is of course a really big hot potato, with various Christians of good faith and conviction taking differing positions on this. That is the stuff of another discussion, and I will not enter into that debate here (although I tend to lean to the conservative side of things if one must know!). It too would likely take another 8500 words just to lay out all the complex issues involved, including textual, linguistic, biblical, theological, cultural and historical concerns! But back to the term in question. If you pull out your Greek New Testament (or, if need be, a Greek concordance, or even a good English concordance if that is all you have available), you can see how often the actual Greek word is used, and how it is rendered into English. If we simply stay with the KJV here, we see that the Greek word in question, diakonos, is found almost 30 times in the New Testament, and it is translated as “deacon” in various places, such as Phil. 1:1 and 1 Tim. 3:8, 12. The translators of the KJV themselves sometimes chose the rendering “deacon,” and sometimes chose “servant” or “minister” etc, depending on the context. The truth is, there are judgment calls in every single Bible version as how to best and most precisely translate the word or words of one language into that of another. So again, there is no sinister conspiracy here, nor some terrible, or some superior, versions. We simply have various options presented to us, and we try as best we can to get the best and most reliable results as we translate. In sum, the way this Greek word is translated does not necessarily amount to a “serious error” in various newer translations, nor is the KJV, as I tried to argue here, necessarily the more “reliable version” when it comes to this passage, or others. But thanks for your comment, as it helps to further elucidate matters here. I vaguely remember the first time I came across the term “Textual criticism”. There was no explanation, at least, none that I understood, and thought that the whole idea was an attack on the Bible. That was upsetting. I’ll bet that there are a lot of KJVO’s shut down further discussion on that basis alone. Then there was “Higher criticism” which should have been termed “Lower criticism”. Sounded a lot better. Usually the left agenda does sound better in its terms. I’m finding that there are still lots of people that maybe not KJVO’s but are certainly Textus Receptus only. We recently looked at the life of Silas and discovered that Acts 15.34 is not in the “critical text”. A little heat was generated about whether Silas returned to Jerusalem or stayed in Antioch. Those who advocated the view that he stayed in Antioch were not open to a discussion. Interesting. It seems that the excluded v34 has a lot of variants, while vs 33 and 35 have none. From this alone one can perhaps see why v34 was excluded from the CT. If he stayed in Antioch, then the story in v 33 and v 35 is questionable. If he returned to Jerusalem then the immediacy & casual tone in v40 sounds strange. We cannot really explain it by suggesting that he left and soon returned. MMMmmmm! One has to draw the line somewhere. Better to be close as possible to the original source than to be at the other end. Besides, the KJV is not that hard to read so I don’t see the problem. Of course one modern translation that I will never accept is the JW’s NWT. It’s an abomination. Thanks Joe. Of course it should go without saying that when I claim we can use some modern versions, I am NOT referring to bogus “translations” like the NWT. It is just the propaganda tool of a heretical cult, meant to deceive. So obviously I am not endorsing something like that. This is so needed Bill, thank you again for your burden for the church as expressed in your many articles and speaking engagements. I hope when it time to stand before our Lord and Saviour He will be delighted in showing you the fruits of your labours. I am developing an enormous admiration for our heavenly Father who not only has done all things well but He has done it in spite of us, in spite of our weakness of the flesh. Take His word for instance. Muslims are taught that their so called ‘holy book’ was actually written by God. Of course it is one glaring lie and the only reason it is believed is because one is not to the anger their god by asking questions. But the Lord God Almighty sent the Holy Spirit to flawed people and was still able to present the world with His most precious revelations so that many may be saved. It is sound, accurate, dependable and indeed Holy yet, at the same time, it has man’s tiny fingerprints of imperfection right through it. There is no wonder so many have died trying to protect it and share it. I’ve had brushes with KJV Only people whilst on the outreach and found them to be difficult to have a conversation with them. I try convincing them that the only truly anointed word is my 1982 New King James. But alas to no avail. I don’t suppose many preach sermons on the “linen yarn” using the KJV. I love the KJV because it has a ‘rhythm’, its quite a literal translation and it’s faults are well known. I personally agree with Bill, but to tell the truth, I don’t like the niv bibles, none of them but I do like the nasb and the kjv. but the kjv has Lucifer in Isaiah 14:12 but the nasb rightly says morning star. Also 2 Samuel 21:19 is Goliath. It’s been a few years since visiting your site and I was drawn to it recently by a member of my congregation, particularly relating to a subject very close to my heart, and that is the source of the Bible in English. I have only read your first blog post on this matter and can see where you are going, but you do have several errors already and I can’t help thinking you must have been hurt by those who cancelled your appearance…..
My question is simple: Did God promise to preserve his words? If he did, we have a discussion on our hands and can all be blessed by it if you have the temerity to pursue it; if he didn’t promise such a thing, nor is such a notion even presumed, we can pack up and go home and forget the whole thing. We begin arguing for Creation from the Bible, we need to argue for his words from the same place. Thanks Edi. I have not posted your full comment, for two reasons. One, when someone does not show me the basic respect and courtesy to actually read an entire article first before attacking it, I am not very impressed to be honest. It shows intellectual laziness and a lack of Christian grace. Also, given that most of your criticisms were in fact already covered in the entire 4-part article which you chose not to read, that makes such comments especially unhelpful, and I will not waste my time here repeating myself on these matters. As to being uninvited by the KJV Only group, um no, it did not bother me in the least. It simply showed how immature, churlish and clueless they are. And groups like that I prefer NOT to speak to if they are that far into such unhelpful, even cultic silliness. And the answer to your question is as easy as can be to answer, and I already dealt with it in the rest of my article and in other comments. Yes God has promised to preserve his word, but no, of course he has NEVER promised to preserve a particular English translation, and one that did not appear until 1600 years after the time of Christ. How foolish to even think like that. Since you oddly think it is so horrible that a number of English translations of the Bible exist, then I presume you are a strong Roman Catholic, and think it is also a shame that so many Protestant denominations exist, instead of just one ‘true church’ based in Rome. Sorry, but I will not spend any more time on this, since you are clearly closed to actually learning and understanding things here, which is a real pity. As I said at the end of Part 4, those who just want to launch an emotive knee jerk reaction, and won’t even bother to read what they are attacking will not be given a run here. Well balanced and accurate presentation and very well written. Thank you for addressing a topic that is frequently ignored rather than dealt with in Christian love. I look forward to reading the other parts. God bless.